Is China embarrassed by North Korea? Is Beijing at last ready to pressure Pyongyang to end its nuclear arms program? Is the rogue state serious about trading nuclear disarmament for mountains of economic aid and diplomatic recognition? Amid reports and hopes of a possible breakthrough in Beijing at the beginning of a new round of six-way North Korean nuclear disarmament talks, the Voice of America has published an in-depth analysis of the Chinese position that addresses the above questions. While we remain skeptical of North Korean--and Chinese--intentions, we believe the article deserves wider distribution, especially in China, where VOA is inaccessible. One highlight: the difference between Chinese perceptions of "pressure" and "influence." VOA Senior Correspondent Andre de Nesnera contributed the analysis, which appears below. The conventional wisdom is that China is North Korea's staunchest ally and its greatest source of support in the international community. 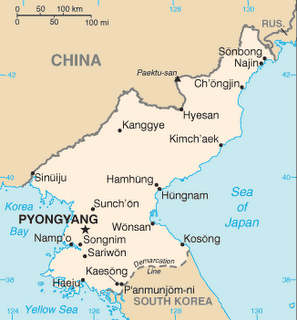 Economically, Beijing is Pyongyang's major supplier of food and energy. Roughly 80 percent of consumer goods found in North Korea are made in China. Politically, for the past several years, China has been the host of the six-party talks bringing together, in addition to Beijing, the United States, Russia, Japan, South Korea and North Korea. The aim of these negotiations is to persuade Pyongyang to eliminate its nuclear weapons capabilities. Jim Walsh, a security studies expert at the Massachusetts Institute of Technology, says China's role is crucial. "They are the country closest to North Korea politically and otherwise, in terms of an ally in these talks," he says, "and frankly, the North Koreans need an ally. The North Koreans aren't going to agree to opening up their country to inspections or putting themselves at risk unless they've got someone to watch their back--and that's the role of the Chinese. The Chinese are both convener of these meetings and also gentle encourager --sometimes more gentle, sometimes less gentle encourager--of North Korea to make progress." Experts say that despite North Korea's close political, economic and historical ties with China, Pyongyang has attempted to show some independence from Beijing. "China has been embarrassed, just in the last year, by the North Koreans," asserts Daryl Kimball, executive director of the Arms Control Association, a national US group. "North Korea conducted missile tests in July 2006 in defiance of the Chinese, just days after a high-level visit from a Chinese diplomat to North Korea. North Korea conducted this October a [nuclear] test explosion in defiance of China's publicly stated wishes for it not to do so. So, China's influence is strong, but it does appear to have its limits." Kimball says there is a lot of debate as to how much pressure China can exert on North Korea. Walsh agrees--and disagrees. He says Beijing has a different view of what constitutes "pressure." "When the US talks about pressure, it talks about cutting off fuel oil or economic sanctions, that sort of thing," says the MIT researcher. "The Chinese emphasize political pressure, not economic pressure. And they don't even use the word 'pressure', they say 'influence.'" Pyongyang's missile launches last July prompted China to vote for a United Nations resolution condemning the tests. But China agreed to the text only after an original draft was watered down. Bruce Bennett, a senior defense analyst at the RAND Corporation, says both China and South Korea are in a difficult position, because they fear that putting too much pressure on North Korea would destabilize the region. Says Bennett: "If the regime suddenly collapsed in North Korea, you would have a horrendous situation for both China and South Korea , and so both governments are very reluctant to put too much pressure on North Korea, fearing a mass of refugees, a collapsed economic system, a military that's out of control and so forth. So at this stage, China is doing some things in trying to put a little of pressure on, but they are afraid that if they go too far, they could wind up with an incredible mess that they don't want to have to deal with." Analysts agree China has some leverage, especially in the economic sphere. But they also say the Chinese leadership must figure out how much pressure it can exert and how far it can go before it triggers instability in North Korea and, potentially, an even greater crisis.